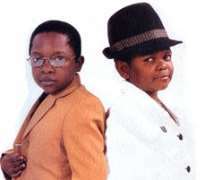 The Flood with Love campaign enters another day with the touching picture of two Nollywood actors Chinedu Ikedieze and Osita Iheme. The day 16 of the campaign features 'Aki' and 'Paw Paw', as they are commonly known, with the former weeping while he struggles to save the latter who appeared to be drowning. Individuals who are interested to help the flood victims are to donate N100 by sending FLOOD to 35388 to help with the Flood Relief and Rehabilitation process. The campaign has featured celebrities like, Eku Edewor, Stephanie Okereke Linus,Jay jay Okocha, Banky W, Onyeka Onwenu, 2face Idibia, TeeBillz and Tiwa Savage, Lynxx, Funke Akindele, Iyanya,Wizkid and Burna Boy and will feature celebrities in days to come.